Our Chatham-Kent Community Heritage and Barn Quilt clubs joined forces to create this community landmark celebrating the 100th anniversary of 4-H in Ontario. Members of the “Live Laugh Quilt” club designed and painted the quilt mounted on the 4-H barn at the Ridgetown Fairgrounds. 4-H’s Centennial quilt pattern combined with our clubs addition of the Card Trick pattern in the center represents the four Hs: Head, Heart, Hands, and Health, all working together to complete one’s self. 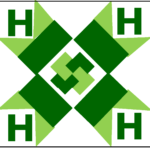 The 4-H colours are green, denoting growth and living things, and white for purity and clarity. The first clubs were called Boys and Girls Club and were agriculturally based. Today, 4-H can be found in rural, urban, and suburban communities across the province. Club topics are not limited to agriculture and now include life skills, crafting, engineering, the arts, and personal and financial fitness. This barn, built in 1959 to accommodate 4-H meetings and achievement days for swine, beef, dairy, sheep, poultry and rabbit clubs, is a result of the funding efforts of dedicated local farmers and 4-H members who canvassed door to door. Kenneth G. Clark was instrumental in making this building a reality. It is still used year-round for community and 4-H functions. 100 Years of Learning To Do By Doing was designed and created by: Morgan Anderson, Chloë Funnell, Sydney Funnell, Becky May, Hanna Reid, Lauren Ross, Lauren Sayers, Molly Sayers, Hanna Willemsma, and Juliana Willemsma. Leaders: Kyla Reid and Amber Sayers.